Dismissing the Kelantan government’s accusation that the Temiar Orang Asli of Gua Musang had broken the law, the activist lawyer says they should let the court decide. 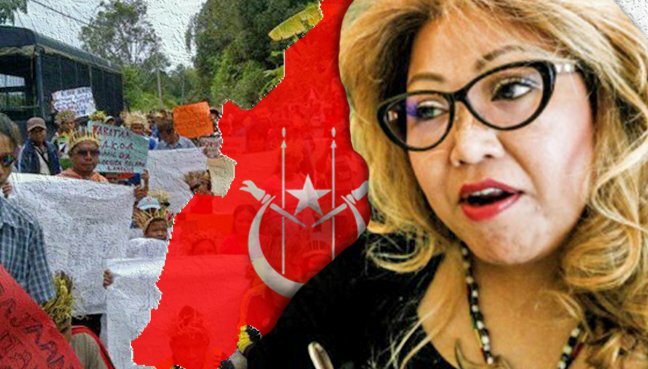 PETALING JAYA: Lawyer and activist Siti Kasim has challenged the Kelantan State government to take the Temiar Orang Asli to court. She issued the challenge following the statement by Kelantan Deputy Menteri Besar Mohd Amar Nik Abdullah that 200 or so Temiar Orang Asli in Gua Musang had infringed the law by putting up two blockades to prevent licensed loggers from extracting logs at the Balah forest reserve. “I challenge them. Tell them that,” she said when contacted by FMT. Siti dismissed arguments and questions as to whether the forest reserve belonged to the Orang Asli. Siti has been involved with the Orang Asli community for a while now, having recently been witness to the arrest of three Orang Asli by police for setting up a blockade to protest against rampant logging activities. Mohd Amar had earlier been asked to comment on the legal rights of the Orang Asli who formed two barricades preventing logs from leaving the 239ha and 404ha sites at the forest reserve.